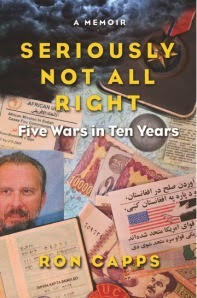 Ron Capps is the author of the new memoir Seriously Not All Right: Five Wars in Ten Years. He served in the U.S. Army and the U.S. Foreign Service. 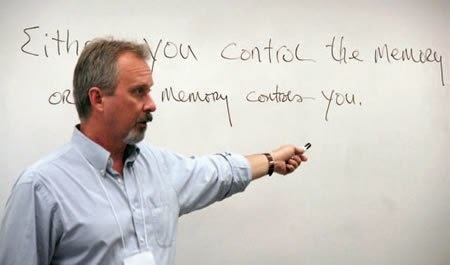 He is the founder and director of the Veterans Writing Project, and his writing has appeared in a variety of publications, including Time magazine and The American Interest. He lives in Washington, D.C., and Youngsville, N.Y.
Q: Why did you decide to write a memoir, and why the title "Seriously Not All Right"? A: Well, it’s somewhat complex, but bear with me. I was a reporting officer for the State Department—a Foreign Service officer doing political work—and an intelligence officer in the Army. My main task in both of those jobs was to go to interesting places, work hard to understand the culture, the people and their lives, and any conflicts ongoing, then to write about what I saw the country and my thoughts about what it meant for U.S. policy. Over the period from 1996 to 2006 I went to report on five separate wars: Central Africa, Kosovo, Afghanistan, Iraq, and Darfur. The thing about reporting for the government is that your readers—analysts, staff officers, desk officers, policy designers—expect pretty straightforward reporting. So I was expected to write crisp, dry accounts of messy horrible acts of cruelty. I found that, over time, I needed to tell more of the story. So at night when I would go back to my tent or my room, I would write the rest of what happened. The thing is that because of my exposure to all of that violence, I developed Post-Traumatic Stress Disorder. I tried to ignore it but couldn’t, so I sought medical care. I found that therapy didn’t work; therapy and meds didn’t work; therapy, meds and alcohol didn’t work. What worked for me was writing. I used writing as a way of getting control of the traumatic memories that were at the root of my struggle with PTSD. The book is the result of writing those stories down. The title comes from a time in Afghanistan when I was in treatment for PTSD with an Army psychiatrist. He asked me to develop a method for tracking how I felt from day to day. I came up with a simple continuum ranging from “all right” on one end, to “vaguely not all right” in the middle, to “seriously not all right” at the far end. My publisher and I decided this was as good a description of the story line as any. Q: You write in your book about "moral injury." Can you describe that, and how it has affected you and others dealing with PTSD? A: Moral injuries occur when combatants are involved in incidents that challenge their core beliefs about humanity or that transgress their sense of morality. I think often of the soldiers in Rwanda who witnessed genocide but who were restrained by their commanders from doing anything about it as suffering what could only be a moral injury. In my case I was often constrained by diplomatic rules or political decisions from taking action to stop suffering—this happened in Kosovo, Zaire, and Darfur particularly. Personally, I think this type of injury is one of the hardest to repair because it gets quite often at actions not taken rather than those taken—someone more religious might think of sins of omission rather than of commission. Q: How did you end up starting the Veterans Writing Project, and what impact has it had on those who have participated? A: Once I left government service (at the end of 2008), I went back to graduate school at Johns Hopkins—this time for writing. I was using my GI Bill benefits and as I got close to graduation I started wondering what I was going to do with what I had learned. I felt that I needed to show something for having used the taxpayers’ money for something like a writing degree. The idea came to me to just give it away—to give to others what I had learned in grad school but also as a working writer (I was getting pieces published in TIME, Foreign Policy, The American Interest, and some other places.). So I though about what that might look like and the VWP model is what I came up with. I think one of the best things we do is simply give people the skills and confidence to tell their own story and by offering them a place to feel safe while they learn and get started. We’ve had veterans from World War II, Korea, Vietnam, the Gulf War and Somalia, plus Iraq and Afghanistan come through—and we’ve had their family members, too. We also provide them a platform to publish in our journal, O-Dark-Thirty. Q: You describe the "contradictions inherent in the military medical system." What do you think should be changed, and is it likely to be? A: Right. The doctors in the military medical system have, necessarily, a divided loyalty. They have to provide care for the patient and to protect the patient’s rights. But they also have a duty to protect the service and to insure that the patient—in my case a field grade officer with a top secret security clearance and over one hundred people working for me—can carry out the mission. In my case the doctor allowed me to keep my treatment hidden from my commander so that I could remain in theater, as long as I was actually in treatment and he could supervise my recovery. Should this be changed? I don’t know. That’s a pretty challenging policy question that bigger thinkers than I should tackle. A: A novel. It takes place in The Sudan in 1916 and involves the politics, diplomacy, and military force involved in subverting and eventually defeating and killing the last Sultan of Darfur, Ali Dinar. A: Really, only that many, many service members suffer from some level of PTSD and that the huge majority of us will be just fine in the long run. Don’t think of returning veterans as any sort of ticking bomb or Rambo-type character to be feared and monitored. We’ve had some experiences that most others haven’t and we’re dealing with those pretty well in most cases.